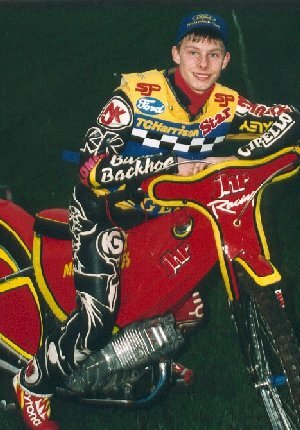 Adam rode for his home town team the Buxton Hitmen in 1999. Highlights of his season included the Bronze helmet won from Andrew Appleton of Newport, and victory in the Hull 700 Individual event. 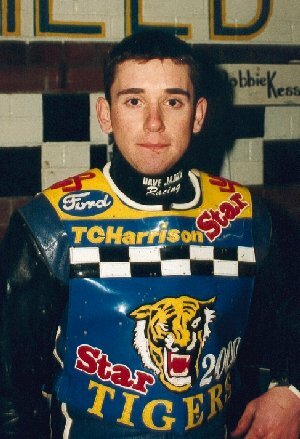 Adam will be spearheading the Sheffield Prowlers in 2000 and started in style with a 16 point return against his old club. Captain James missed the opening match following his high velocity demolition of the safety fence whilst riding for the Tigers. After a night in hospital for observation following head injuries James was able to attend the opening fixture and encouraged the team to their first victory. Sixteen year old Matt Cambridge is very enthusiastic and a natural on a bike. Matt is looking forward to a long term future here at Owlerton. Son of the late Kenny Carter, Malcolm is as wild and enthusiastic as they come. Made a nightmare debut against Buxton breaking the tapes in heat 1, falling in his 2nd ride and then again in his third sustaining a broken right leg when his machine landed on top of him. Thrust into heat 1 of his very first match Lee looked like making a dream debut as he led for 3 laps before suffering machine problems. Fifteen year old Lee bounced back to win his next two outings in fine style. Lee and his father Kevin seem to have been part of the nuts and bolts of our training facilities for years. 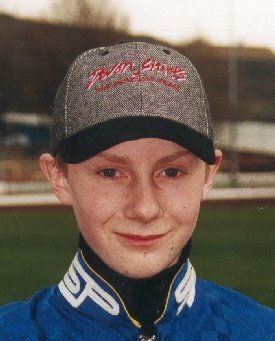 Andrew finished fourth in the British under sixteen championships in his first ever speedway meeting. 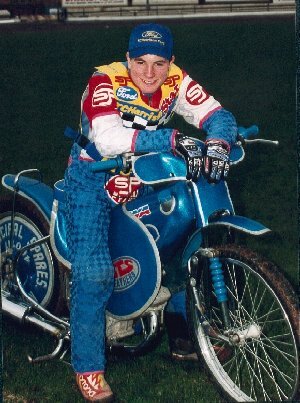 He was picked to ride for Peterborough Thundercats '98'. and also rode as number two for Skegness. 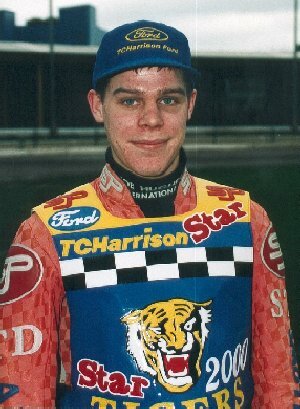 He finished second in the British under sixteen championships in '99, and second in Sheffield's junior select meeting He gained further rides for Mildenhall, and the Prowlers in the Youth Development League. He was also third in the Conference League Championship staged at Buxton. Seventeen year old Andrew is now fully recovered from multiple injuries sustained at Newport last year. Many believe he'll be the next big name to emerge and he's very professional. A favourite with the fans for his lack of gating skills, every point is earned in spectacular fashion! 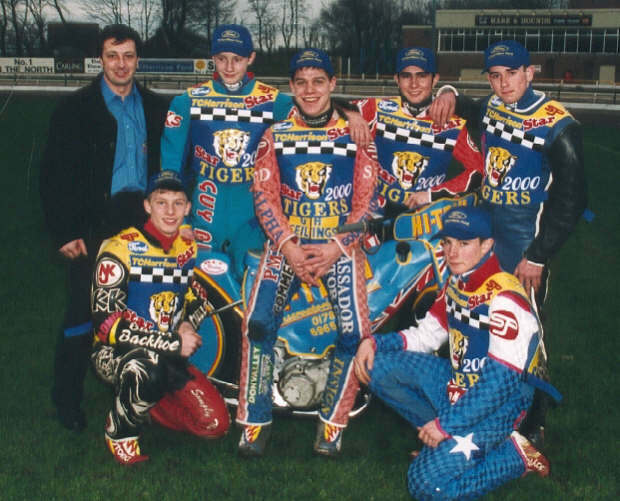 Andy put last years Newport crash firmly behind him as he took the Bronze Helmet from Chris Courage on this years visit after leading the Tigers to victory. David made a dream start in his debut against Mildenhall as he passed the field to win his very first race. Andy's debut was at Mildenhall deputizing for the injured Malcolm Carter. Jamie has been around for a few years now and is another Prowler who rode for the Hitmen last year. He will act as team manager and ride when necessary, but his real role will be in the pits.